South America has become well known for its giant rodents. The largest ever, Phoberomys, is reported by Sanchez-Villagra etal. (2003). Until then, this form had been known only from isolated teeth and fragmentary postcranial bones, until the discovery of an exceptionally complete skeleton in a rich locality of fossil vertebrates in the Upper Miocene of Venezuela. Phoberomys was 3 m long and it stood 1.3 m at the shoulder. It weighed 700 kg, more than ten times the mass of the largest living rodent, the capybara, and 700 times the mass of a guinea pig. At the time of discovery, it was said that 'if you saw it in the distance on a misty day, it would look much more like a buffalo than a rodent'. Phoberomys was probably semi-aquatic, like the capybara, and foraged for reeds and other tough aquatic plants along the river bed. Phoberomys lived in a lush, warm habitat, in rivers that teemed with crocodiles, catfish and enormous turtles. With its vast bulk and shortish forelimbs, Phoberomys and other giant rodents probably could not move very fast. Predators included crocodiles up to 10m long, the flesh-eating flightless bird Phorusrhacos (see p. 281) and large marsupial 'cats' (see p. 316). Phoberomys probably could not flee from these predators, nor could it squeeze into a small hole in the river bank. This vulnerability to predation, together with cooling climates in the late Miocene, may have contributed to the demise of the truly giant South American rodents. of the dramatic radiation of murids happened in the Pleistocene. Detailed studies of their superb fossil record have shown high rates of evolution: 217 species and subspecies of Microtus in North America in 1.5 Myr, 180 species of cricetines (voles) in South America in the past 3.5 Myr, over 100 species of murines in Africa during the past 10.5Myr (Korth, 1994). These dramatic evolutionary rates are confirmed by molecular studies. The hystricognaths include several lines that radiated in Africa and South America in the Oligocene and Miocene. The early porcupine, Sivacanthion (Figure 10.44(d)) from the mid-Miocene, is unusual in that it occurs outside Africa, in Pakistan. The largest hys-tricognath group is the Caviomorpha,the South American guinea pigs, capybaras, chinchillas and New World porcupines. The largest living caviomorph, the capy-bara, weighs 50 kg and fills an ecological niche more akin to a warthog than a rat or squirrel. But it is a midget compared with some of the giant caviomorphs of the past. Telicomys from the late Miocene and Pliocene (Figure 10.44(e)) reached the size of a small rhinoceros and even that has been exceeded by Phoberomys from Venezuela (see Box 10.11). The origin of rodents in South America has been disputed, and they might have migrated in from Africa or from North America. The oldest South American rodent, from close to the Eocene-Oligocene boundary, in the Tinguiririca fauna of the Chilean Andes (Wyss et al., 1993), seems to settle the question. It is associated with typical South American mammals, such as ameridel-phian marsupials, edentates, litopterns, astrapotheres and notoungulates (see pp. 315-22). The new rodent has a five-cusped upper molar, as in later caviomorphs, and this is most similar to Old World hystricognaths. The specimen confirms an African origin of the South American rodents, just as for the South American monkeys (see p. 370). The phylogeny of rodents is controversial (Luckett and Hartenberger, 1985). Morphological data show that the rodents are a monophyletic group and most recent molecular studies confirm this (Huchon et al., 2002; Adkins et al., 2003; DeBry, 2003; Misawa and Janke, 2003). 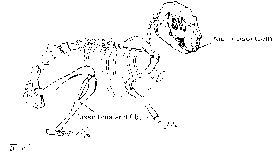 Some earlier molecular studies had suggested that the South American caviomorphs were not even rodents, and had had a separate history since the Cretaceous: this view is now rejected. Rabbits and their relatives (Lagomorpha) have generally been grouped close to the rodents, not least because both groups share long ever-growing incisor teeth. Lagomorphs include two living clades, the leporids (rabbits and hares) and the ochotonids (short-eared and short-legged pikas). Lagomorphs have a second small pair of incisors in the upper jaw while rodents have only one, but the similarities in the skull otherwise are very striking. 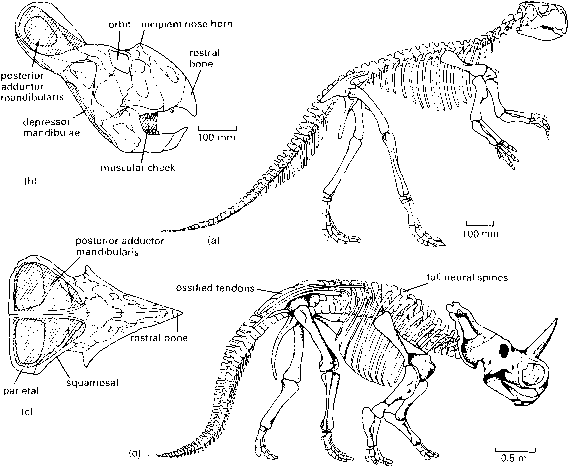 Palaeolagus from the Oligocene of North America (Figure 10.45) is very like a modern rabbit. The tail is short, the hindlimb is long (for the characteristic bounding mode of locomotion in rabbits) and the limb girdles are strong (to take up the impact of landing). The long incisors are used for nipping grass and leaves from bushes, and the broad cheek teeth are adapted for side to side grinding, rather than the proal movements seen in rodents.